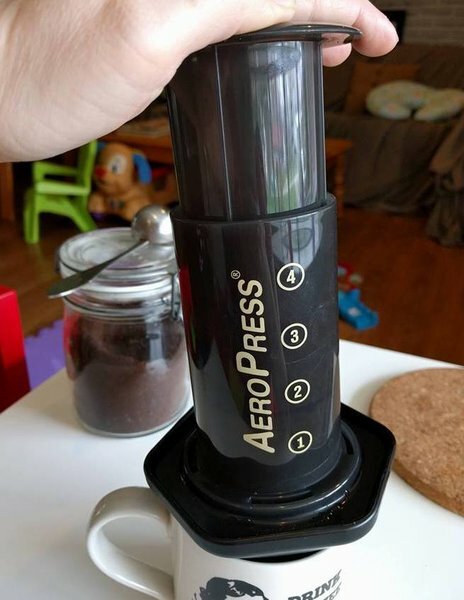 I just received an Aeropress as a gift. How do I get good coffee out of it? I want to be a coffee snob when I grow up, but I just haven’t had the time or money or patience to really start down that path yet. One of my most lovely friends knew of my dream and sent me an Aeropress to try, and I unboxed it with absolute delight. Coffee snobbery, here I come! One tiny hiccup in my plan: my new Aeropress was secondhand, and didn’t come with instructions! I had a basic idea what to do with it, since I’ve used a French press before and the concept is similar enough, but I wanted to do it right, and get perfect coffee out of the Aeropress on my very first try. So I searched online for how-to guides. There are a ton of them. Every coffee blog out there has an illustrated step-by-step guide to the perfect Aeropressing. They’re lovely, and I’m sure they’re accurate. But I am an amateur coffee snob. I’m the kind of person who usually buys Kirkland Colombian coffee in the 3lb bucket, not handpicked singing Arabica beans delivered from the Hawaiian mountainside by emerald hummingbirds. I just want coffee. I don’t want to drag out a kitchen scale and a thermometer. It’s 6am. My toddler will be up any second. Coffee. Now. Please. 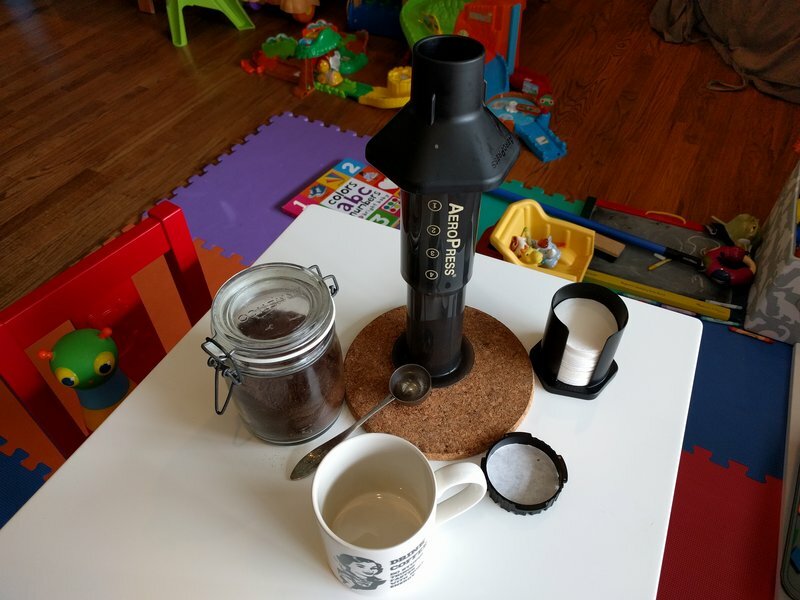 How can a normal person get great coffee out of an Aeropress? I’m mostly normal. Depends who you ask. Here’s how I’ve been doing it so far. I’ve got a whole week of use behind me, so I’m totally qualified to write my own how-to guide. 1. Collect all your junk in one place. Coffee, coffee scoop, cup, spoon, Aeropress parts, and Aeropress filters. Fill up a measuring cup with water (about 1.5 cups) and put it into the microwave to boil. Or get the kettle on. Whatever it takes to get boiling water. 2. 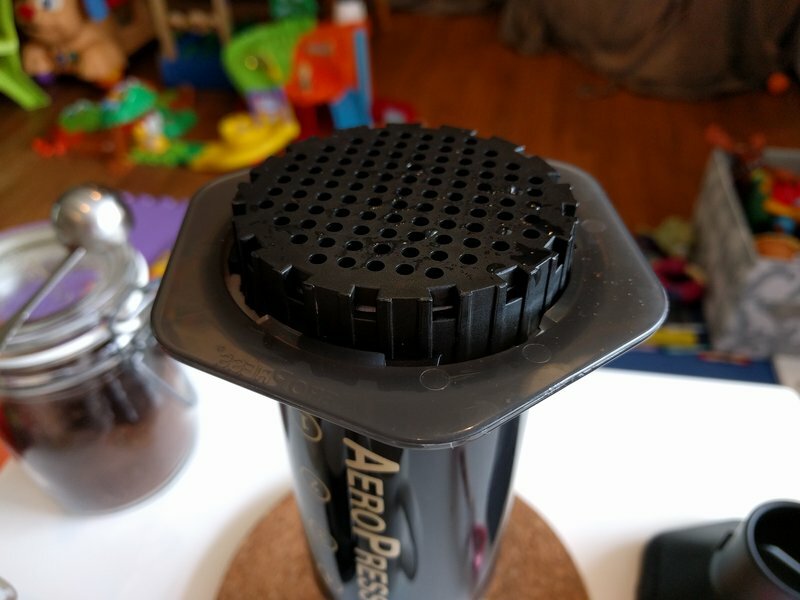 Assemble the Aeropress so the plunger is just inside the chamber making a nice tight seal. Stand it up, upside-down, and put in two flat scoops of coffee. My scoop delivers about 1.5 tablespoons when flat and about 2 tablespoons in a rounded scoop. So we’re looking at about 3 tablespoons total of fine-grind coffee. 3. Fit a paper filter into the holder, then go get your water. Carefully, and over your mug in case you spill, pour a tiny bit of water onto the filter to wet it and help it stick in place. I use a spoon to do this because I can’t be that precise with boiling water, especially before I’ve had my coffee! 4. Pour hot water into the chamber of the Aeropress, over your coffee grinds, until it’s about half an inch shy of the edge. Stick a spoon in there and give it a good stir. One of the coffier-than-thou how-to-Aeropress guides I found suggested that I should “stir the grounds with a bamboo paddle or butter knife.” What, I ask you, is wrong with a spoon? YOU ARE STIRRING A THING. USE A SPOON. 5. Wait 2 minutes or so. This will vary depending on personal taste and what kind of coffee you’re using, but I find that it’s better to err on the side of stronger coffee, because I can always dilute it with hot water afterwards. There’s no good way to rescue a weak cup of coffee. My current favorite fancy “treat myself” coffee is Peet’s Major Dickason’s blend, and I find that two minutes is exactly right for a full chamber and two scoops. 6. 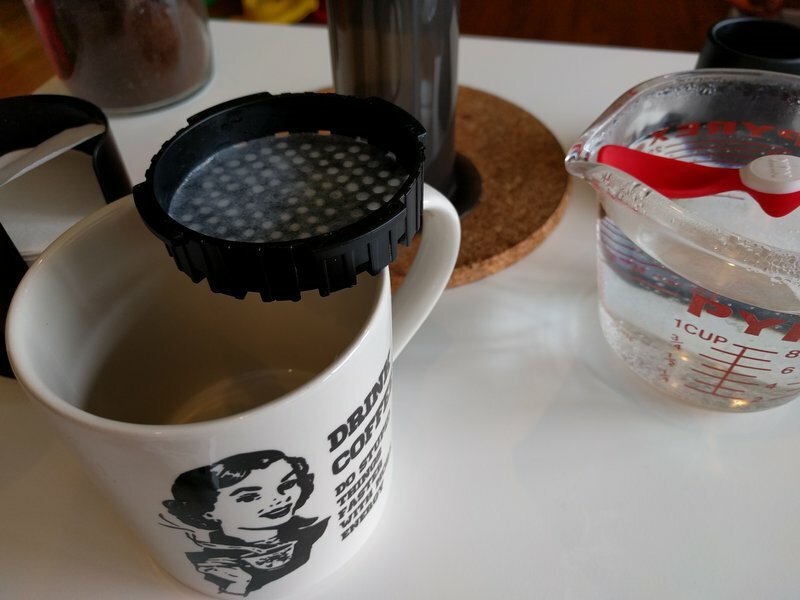 Carefully attach the filter holder to the chamber – remember, this is almost-boiling water we’re playing with – and then flip the whole thing over onto your mug. 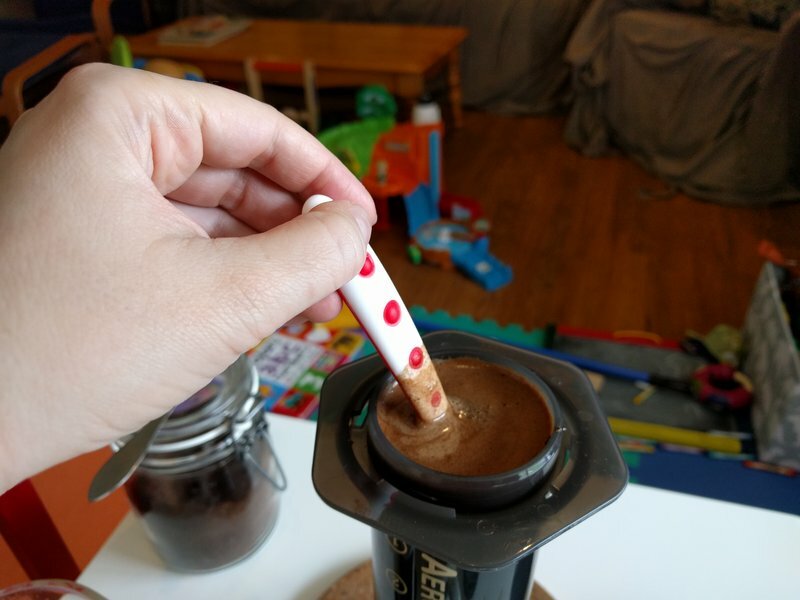 I haven’t experienced any leaking during the flip, but you can always sit your empty mug upside down over the Aeropress and flip the whole thing over that way if you’re concerned. I usually use the plastic funnel attachment to that the thing sits more securely in my mug and is less likely to tip. 7. Slowly press down on the plunger and squeeze coffee out into your mug. It should take about 30 seconds of steady pressure, and you’ll hear a little hiss from the filter when you’ve hit the bottom. 8. Sample the coffee concentrate, add hot water until it tastes right to you, and then enjoy. 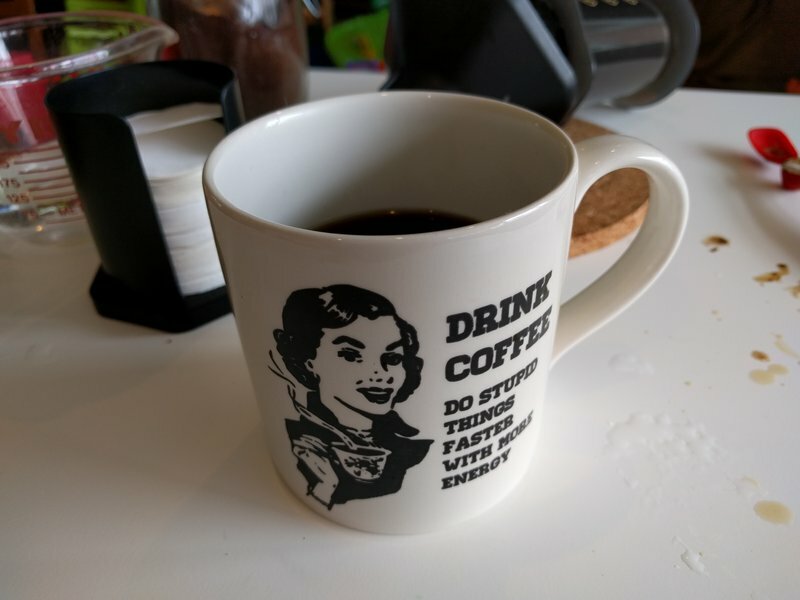 You have to press pretty hard on your Aeropress to get the coffee out, so I wouldn’t recommend using a delicate family heirloom coffee mug for this. You can always use something stronger, like a small measuring cup, to press into, and then transfer the coffee to the mug afterwards. I just try to use a good tough mug, because I don’t want extra dishes. I’m sure that if I took the extra effort to weigh out my coffee and water and to measure the exact temperature, I’d end up with better coffee. But I’m not aiming to win coffee competitions, just to get a tasty cup of coffee in the morning. Please, if you’re into precision, get out that scale and weigh your 17g of coffee. You’ll probably have better coffee than me. I can live with that. 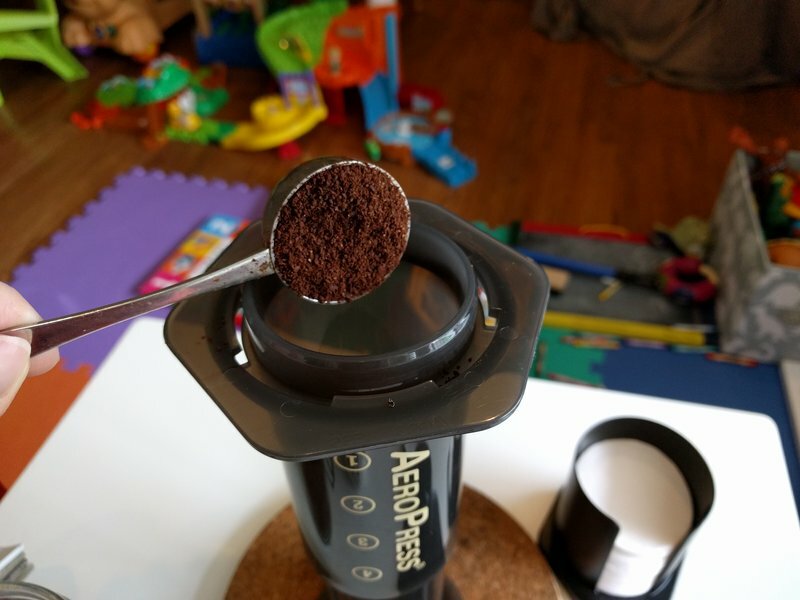 This is the “Aeropress inverted method,” since we’re starting with the gadget upside-down. You can also do it the other way, and start with the filter in place and the Aeropress standing up over your mug. You’d add water to the chamber, wait, put the plunger in, and press, instead of screwing the filter on just before flipping the whole thing. I do the inverted method because I live for the danger. Also because my friend told me it was better, and I got tired of reading the coffee snob sites to see if she was right. Any Amazon links on this page are affiliate links. Read more about that here. This entry was posted in Food and tagged aeropress, coffee, experiment on March 31, 2016 by antijen.